The APSU Govs outshined their Ohio Valley Conference brethren, besting Belmont (54.5, fourth), Jacksonville State (32, eighth), Eastern Kentucky (17, 10th) and Morehead State (5, 13th) in the event. Saturday got off to an outstanding start thanks to Austin Peay’s showing in the pole vault, but this week’s victory came for a new source: Dascha Hix. The senior posted a career-best 4.00m mark to earn her first victory in the vault since last year’s Thundering Herd Invitational, moving into first place in the OVC and into a tie for 46th nationally with that height. Austin Peay’s habitually high-achieving Savannah Amato was runner-up at 3.90m. While the field events provided their share of points, with Maya Perry-Grimes (seventh, 5.30m) providing some extra points in the long jump, the track was where it was at on Saturday. The 60m hurdle contingent got the day off to a fantastic start, putting three runners in the finals and two more—Kaitlyn Black and Denia Hill-Tate—barely a tenth of a second outside the last heat. In those finals, sophomore Lennex Walker placed third thanks to an 8.78 run, with freshman Camaryn McClelland (fifth, personal-best 8.84) and sophomore Kamille Dunbar (eighth, personal-best 8.98) adding crucial points to the tally; for Dunbar, that represents the first sub-nine second 60m hurdle attempt in her Austin Peay career. 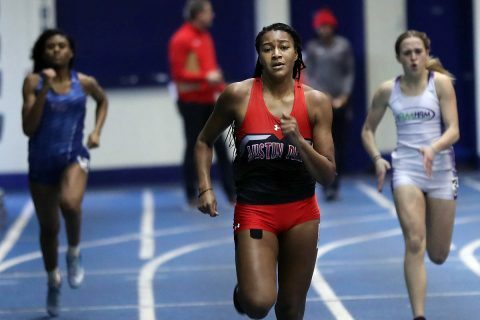 To no one’s great surprise, junior Tymeitha Tolbert picked up an easy victory in the 60m dash; the surprising part is that she posted a 7.57 mark in the finals—one-hundredth of a second off her season-best and two-hundredths shy of the school record, which she also owns—while battling illness. Freshman Tiyanna Johnson also earned a spot in the finals and placed fifth overall thanks to a 7.84 mark; she later posted a career-best 25.32 run to take runner-up in the 200m dash, with Perry-Grimes (career indoor-best 25.51) placing fifth. Speaking of easy victories, sophomore Sabrina Richman picked up another one in the 400m dash; her 55.78 mark was more than three-tenths of a second faster than the rest of the field and is a continuation of a sensational sophomore season for the reigning OVC Track Athlete of the Week. Freshman Mikaela Smith is proving to be quite the asset in the middle-distances; she placed fourth in the 800m run with a 2:17.96 mark, building on an impressive showing last week at Vanderbilt. There is no rest for the weary; the APSU Govs return to action next week at the Fred Wilt Open, hosted by Purdue in West Lafayette, IN.